The Central Bank of Hungary has unveiled the new 500-forint banknote upgrade, the last in the current upgraded series of notes which the Bank started to issue in 2014. Specific details are yet to be revealed but there appears to be a new holographic foil stripe on the left of the note’s front as well as an optically variable ink feature of a horse in the centre of the note. Other design changes include subtle differences in the illustrations shown on the front and back of the banknote. The note becomes legal tender on 04 July 2018 but is expected to enter circulation on 01 February 2019, providing sufficient time to upgrade existing banknote processing machines and ATMs. 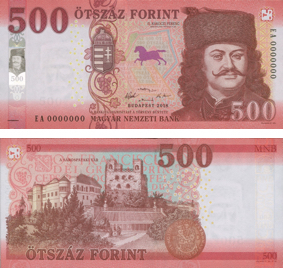 The current 500-forint note, first issued in 1998 and upgraded in 2007, will remain legal tender until 31 October 2019. For further information, read the Magyar Nemzeti Bank press release.